40 loyalty points Your cart will total 40 points that can be converted into a voucher of 1,60 PLN. 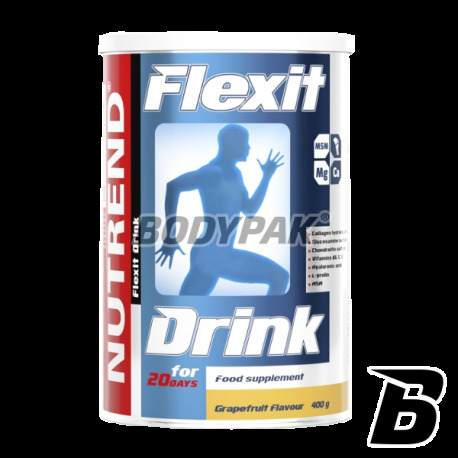 Nutrend Flexit Drink is extremely cheap supplement with a comprehensive action - protects, nourishes and regenerates tissue - joints, joint capsules, cartilage, tendons, ligaments and bone tissue. Effectively protects joints conditioner Nutrend Flexit Drink contains the basic building blocks and precursors of cartilage tissue: glucosamine sulfate, chondroitin sulfate, protein and collagen peptides, amino acids, and vitamins C, B6 stimulating the regeneration of connective tissue, hyaluronic acid - a moisturizing intercellular spaces, increasing resistance joints to external pressure. Supplement regenerating joints Nutrend Flexit Drink also contains easily assimilated forms of calcium and magnesium - to prevent the formation of osteoporosis and vitamin D3. Protein collagen (gelatin hydrolyzate) is a source of a broad spectrum of amino acids and peptides participative in the formation of collagen. Collagen ensures proper development, nourishes and protects the joints. It improves the condition of hair, skin and nails. In this powerful nutrient regenerating joints applied 97% enzyme grafted gelatine hydrolyzate of a high biological value, easy to digest, łatwowchłanialny and immediately used by the body. Cartilage, tendons and ligaments contain collagen protein. Ponds must therefore receive collagen protein, which is necessary to build cartilage ensures proper mobility of joints. The practice of sport is a burden for joints. Their continuous loading causes cartilage is zcieńczeniu. Research shows that gelatin maintains the amino acids in the cartilage unchanged and protects it from damage. Symptoms of deficiency of amino acids forming collagen is joint pain, brittle nails and hair. Regular intake of products protecting the joints provides flexibility to the skin and connective tissue. Collagen hardens the connective tissue and at the same time provides the skin with adequate moisture to prevent the occurrence of cellulite. Glucosamine is formed in the body from glucose. A positive effect on joint mobility and stimulates the synthesis of connective tissue. Glucosamine reduces catabolic processes within the articular cartilage. Participates in the creation of synovial fluid, which allows movement in joints and protects items pond in front traction. Glucosamine is a precursor chondroityny.Glukozamina and chondroitin is an important component of synovial fluid. Besides, glucosamine is a component of cartilage, connective tissue and other vital tissues, especially those related to camera movement. With the progressive aging and as a result of various injuries and disease processes components of these starts in the joints missing. When the body does not have enough glucosamine, goo becomes thinner and more watery, the joints are not sufficiently lubricated and are more vulnerable to exploitation and damage. Other friction elements of our skeletal system as the intervertebral discs (discs) are subject to similar processes. The problem is all the more noticeable the more intense lifestyle lead. The most common deficiencies glucosamine associated with rheumatic disease, degenerative arthritis and trauma in sports and the physical work. Imagine the joint (eg. In a car), which is working hard, turning and moving the load. If the friction elements are well lubricated high quality grease, the hinge will operate for many years without failure. If, however, the lubricant for some reason disappears or becomes rare, more watery - quickly comes to damage, overheating and serious crashes. The deficiencies of glucosamine and chondroitin helps effectively "repair" damaged joints and tissue. Synovial fluid, the equivalent of lubricant in the joint begins again effectively fulfill its function. Ponds no longer hurt. Treatment is conducted efficiently and effectively. We recover condition and able to move freely. Chondroitin sulfate builds and regenerates tissue. Ensuring the proper level by supplementing a diet heavily protects against cartilage degeneration, which have proven scientific research. Chondroitin sulfate is an essential constituent of bone. It has a huge impact on the strength and efficiency of the joints - increases the resistance of both cartilage and bone microtrauma. Collagen is the main protein in our body, a component of tendons, joints and cartilage. It forms the outer part of the connective tissue. Thanks to the binding properties of the water itself acts as a hydrostatic structure which allows it to act like a sponge and absorb the movements of the bones which reduces joint pain and allows you to correct their work. Hyaluronic acid is the main component of the intercellular weight of synovial fluid in the cartilage. The following softness, flexibility and viscosity. The structure of the molecules of hyaluronic acid has properties even at low concentrations, many of the binding of water molecules during the gel-forming connective tissue increases resistance to external pressure. Hyaluronic acid - is a mucopolysaccharide connecting together collagen and elastin fibers in the dermis. Creates water or thick mucus gel. Hyaluronic acid is able to bind from one thousand to four thousand times more water than its weight and therefore is used in cosmetic products as one of the most valuable moisturizing agents. Already 1% aqueous solution of hyaluronic acid have gelling properties. Hyaluronic acid is obtained from rooster combs or prepared biotechnlogicznie. Hyaluronic acid acts as a humidifier in kosmeceutykach - binds water, protects against dryness, smoothes the skin, supports the protective properties. Products of hyaluronic acid may be safely used in winter, because, in contrast to the creams in which the wetting agent is water, do not cause telangiectasia (vasodilation). Hyaluronic acid is also used as a natural filter, protecting the stratum corneum (against the penetration of chemicals and bacteria). He also holds the role of the media tz. substances to facilitate the introduction of other ingredients into the skin. Proline is essential for collagen formation but does so only in the presence of vitamin C, accelerates the regeneration of damaged cartilage and ligament. Most proline present in the structures of the joint ligaments and tendons. There plays a very important role in the reproduction of collagen (destroyed or consumed). Vitamin C is an antioxidant. Eliminates free radicals, damaging the surface of gristle. Vitamin C is vital for the body. Primarily affects the production and preservation of collagen, which is produced tissue. The name of the tissue comes from the role that it plays in our body, because it combines a variety of cells, it affects the retention of their shape and smooth operation. Collagen's bones (including the vertebrae of the spine), the cornea of ​​the eye, teeth, ligaments, muscles, joints, skin and blood vessels. The presence of collagen and therefore, indirectly, vitamin C, promotes healing of wounds, fractures, inhibits the formation of bruising, bleeding and formation of gum bleeding. Thanks to healthy cells become resistant to infection and injury. Vitamin D3 increases the saturation of bone calcium. Vitamin D3 (cholecalciferol) is a vitamin D. In the human body is converted to its active form, which act as hormones. Cholecalciferol produced in the body in the skin under the influence of ultraviolet light. Synthesis in the skin, covers only a small share of the market. The main source of vitamin D is food (meat, milk, egg yolks). The essential characteristic of metabolites of vitamin D3 is to increase the absorption of calcium and phosphate. Vitamin D through the stimulation of a specific protein in the gut facilitates binding and transport of calcium into the blood. Cholecalciferol also increases the absorption of calcium and phosphorus within the kidney. In bone, increases the activity of osteoclast cells (removing old bone cells) and osteoclastic osteolysis (bone dissolution process under the action of osteoclasts). All these actions lead to increased levels of calcium in the blood and stimulate the proper development and bone mineralization. Vitamin D3 when administered orally is well absorbed in the small intestine. In the process of absorption of the essential role played by bile acids. Cholecalciferol and its metabolites are stored in the liver, muscle and adipose tissue, where they are gradually released. They are mainly excreted in the bile in combination with glucuronic acid, glycine and taurine, and in small quantities in the urine. Calcium is an essential building block of kości.Wapń part of the building material of bones and enamel. A total of 99% of the bone structure of the building element and szkliwa.Wapń throughout the exchange is based on the incorporation of bone resorption and enamel. Besides this process is used to carry nerve impulses for the regulation of coagulation, regulating heart rate and the absorption of vitamin B12. Endocrine system and vitamin D affect the economy of the body's calcium. The body is unable to absorb the element without vitamin D.
Recent studies have shown that calcium plays an important role in the body and may also affect the control of blood pressure. The proper concentration of calcium reduces the risk of heart disease, stroke, cancer, colorectal cancer, and kidney stones. A diet rich in protein may increase serum calcium levels, similarly affected by an increased supply of sodium and caffeine, and lack of physical activity and hormonal changes during menopause. A diet rich in fiber affects the inhibition of calcium absorption from the gastrointestinal tract. Oksalidowy acid found in spinach, botwince, rhubarb, almonds and chocolate reacts with calcium to form their salts, which can not be used and metabolized by the body. On the other hand, keep in mind that the increased amount of calcium inhibits the absorption of iron and zinc. Magnesium in combination with calcium affects the nervous system and musculoskeletal disorders. It works on przeciwstresowo organizm.Magnez is an essential element for the proper functioning of the body. Magnesium building material teeth and bones. Involved in the metabolism of carbohydrates, proteins and fats, it activates over 300 cellular enzymes especially those interacting with B vitamins, vitamin C and E. Magnesium also helps in incorporation of calcium into the tooth enamel. 10g (1/2 measuring cup) in the morning on an empty stomach. 20g (full scoop) in the morning on an empty stomach. Składniki: hydrolizat żelatyny, maltodekstryna, glukonian wapnia, glukonian magnezu, aromat, L-prolina, sól potasowa siarczanu glukozaminy (ze skorupiaków), regulator kwasowości (kwas cytrynowy), MSM (metylosulfonylometan), siarczan chondroityny, kwas L-askorbinowy (witamina C), regulator kwasowości (kwas jabłkowy), substancje przeciwzbrylające (fosforan wapnia i dwutlenek krzemu), substancje słodzące (acesulfam K i sukraloza), kwas hialuronowy (sól sodowa), chlorowodorek pirydoksyny (witamina B6), cholekalcyferol (witamina D), barwnik (karoteny). Widać róznicę, może nie kolosalną ale jakość życia na pewno lepsza po stosowaniu i treningi efektywniejsze. Świetny produkt na stawy.Idealny dla osób,które biegają.Smak truskawkowy dobry. Zużyte 2 puszki, znaczącej poprawy niestety nie widać, ale chyba jakaś jest.. Stosowany na czco rano po przebudzeniu. Ból nadgarska ustał, ale cięzko mi stwierdzić, czy to właśnie ten preparat pomógł. Niska cena i kompleksowy skład. Regularnie stosowany przynosi efekty- "skrzypienie" w kolanach ustępuje. Miałem problem od kilku miesięcy z prawym kolanem. Stosuję trzeci tydzień i się sprawdził. Super smak, tabletki jak i proszek od Nutrend robią robotę. Smak Brzoskwinia zdecydowanie na tak. Bardzo dobry suplement, czuć różnicę po 2 miesiącach stosowania. Bardzo dobry skład. W bardzo krótkim czasie pomógł mi pozbyć się problemów z kolanem. Jak dla mnie to brzoskwinia najlepsza. POLECAM. Stosowany kilkukrotnie przy nawracajacej kontuzji kolana oraz przewleklej kontuzji barku. Za każdym razem odnotowana została wyrazna poprawa. Z odpowiednimi cwiczeniami pozwala na wyraźna poprawę ruchomości mobilności i zmniejszenie dyskomfortu obciazonych stawów. Przy profilaktyce w trakcie okresu ciężkich siłowych treningów przy moich dolegliwościach zmniejszył częstotliwość występowania uporczywego dyskomfortu. Zdecydowanie polecam dla mnie jeden z 3 top produktów które używam i po których czuję poprawę. Polecam i pozdrawiam. Jeden z najlepszych suplementów na stawy, rzeczywiście działa i widać efekty. Skład ma wszystko co powinien, smak i rozpuszczalność ok, choć ten smak to różny ... truskawka dla mnie nie do przełknięcia - reszta ok..
Masz Bóle kostno-stawowe? Z Flexitem sobie z tym poradzisz! Stosuję ten produkt od wielu lat.. i jestem mega zadowolony - inne się do niego nie umywają. Najlepszy! stosuję od 2 lat, wypiłam już kilkanaście puszek, pyszny w smaku a co najważniejsze uratował moje słabe kostki! Dwa lata temu nabawiłem się urazu naciągnięcia więzadła kolana prawego Później zaczęły się kolejne problemy. Po pół roku w badaniu USG wyszło mi, że mam III/IV (z IV) chondromalacji rzepki. Lekarz nakazał ćwiczenia mięśni ud oraz zażywania kolagenu, wpierw brałem Colaflex, później przerzuciłem się na powyższy produkt i z czystym sumieniem mogę powiedzieć, że działanie jest znacznie lepsze. Dwa tygodnie temu robiłem ponownie USG kolana i wykazał mi II stopień chondromalacji rzepki, a więzadło wygląda na nienaruszone czyli jest olbrzymia poprawa, kolano tak nie strzyka, nie puchnie i nie boli. Dlatego polecam produkt każdemu po urazach i przeciw urazą. Idealny preparat dla biegaczy. Nie dość że regeneruje tkankę łączną to jeszcze zawiera bogaty pakiet witamin i minerałów w cenie. Jedna z lepiej smakujących i rozpuszczających się odżywek. Stosować przez mniej więcej 3 miesiące potem odstawić na 2,3 tygodnie. Nigdy wcześniej nie używałem takich specyfików więc postanowiłem drogą kupna nabyć dwa smaki: truskawka i pomarańcza. Trochę ponad miesiąc spożywania i mogę powiedzieć, że jak dla mnie produkt jest jak najbardziej godny polecenia. Pracuję prawie cały czas w ruchu, na stojąco i nie ukrywam że doskwierał mi ból stawów itp. Po miesiącu spożywania widzę zdecydowaną poprawę - czuję się lepiej i tak jakoś lżej mi się żyje :) Poza tym od jakiegoś czasu zacząłem dbać o kondycję - lubię sobie popedałować :) Także tego - uważam, że też ten specyfik ma pozytywny wpływ na moje stawy. Jeśli chodzi o produkt: dobrze się rozpuszcza i smakuje bardzo dobrze - przynajmniej jeśli chodzi o pomarańczę bo właśnie dzisiaj skończyła mi się puszka. Jutro zaczynam truskawkę - zobaczymy... :) 5 gwiazdek to dla mnie oczywistośc dla tego produktu. Moje pierwsze spotkanie z flexitem miało miejsce w marcu 2016r. ale wtedy użyłem tylko 1 puchę (w kapsułkach) i nie było tego WOW, które jest teraz. Później była długa przerwa od flexitu. Na początku grudnia 2016r. poszedłem do lekarza skarżąc się na ból i "trzaskanie" (jakbym strzelał palcami) w mostku podczas ćwiczeń, ten stwierdził, że skoro ćwiczę to tak musi być ale udało mi sie zdobyć skierowanie na prześwietlenie RTG klatki piersiowej. Oczywiście radiolog stwierdził, że jestem kompletnie zdrowy i temat lekarzy zamknięty. Na początku stycznia zakupiłem flexit w proszku (smak truskawkowy - lekki i bardzo smaczny) tak profilaktycznie a tu się okazało, że z każdym dniem używania tego środka ból i "trzaskanie" malało by teraz być prawie nie odczuwalne. Druga pucha na wykończeniu a jeszcze chyba nigdy nie byłem tak zadowolony z zakupu jakiegokolwiek suplementu jak z tego. Jeśli się zastanawiasz to szczerze polecam, niedrogi a potrafi na prawdę pomóc na dolegliwości ze stawami. Jeden z lepszych produktów na stawy i ścięgna. Naprawdę jest skuteczny, dolegliwości ustępują jakby ktoś ręką odjął. Cenowo również jest całkiem nieźle więc można stosować również profilaktycznie, podczas dużego obciążenia organizmu lub bardziej intensywnych treningów. Ja stosuję ten produkt profilaktycznie, aby ograniczyć zużywanie się stawów. Jak na razie sprawdza się bardzo dobrze, zero problemów. Można go stosować też w leczeniu już zaistniałych problemów, często zalecany jest też w rehabilitacji urazowej. Jeden z lepszych produktów tego rodzaju, które dostępne są na rynku. Ból w stawie łokciowym minął po regularnym stosowaniu tego produktu - dokładnie po drugim opakowaniu. Obecnie stosuję profilaktycznie jak poleca producent i nie mam żadnych problemów ze stawami, a wykonuję na prawdę ciężkie, siłowe treningi pod trójbój siłowy. Świetnie się sprawdza przy bieganiu, polecam. Barddzo polecam ten produkt, jestem z niego bardzo zadowolony. 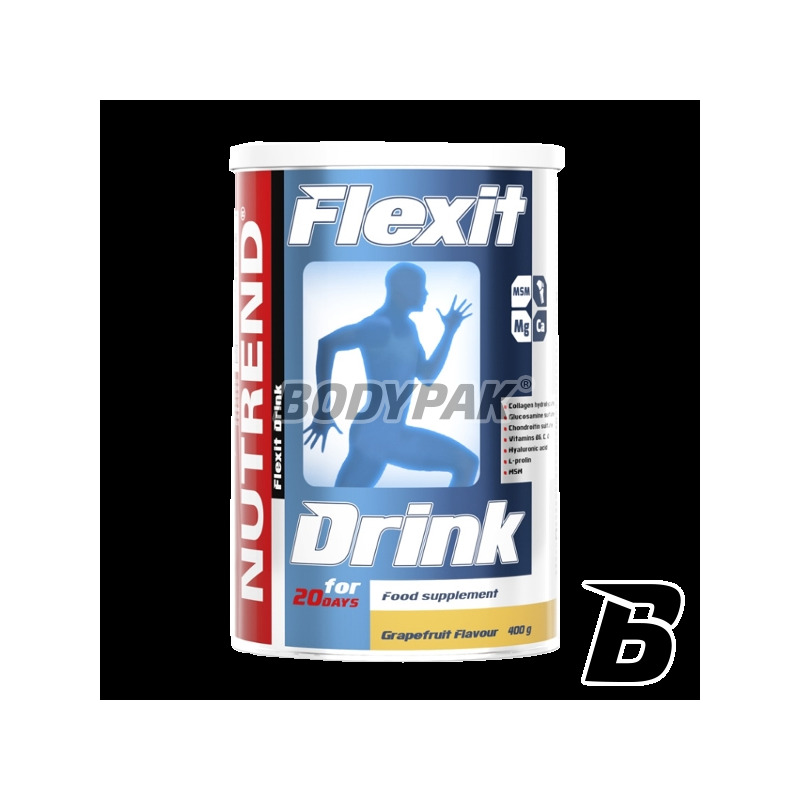 Olimp Flexagen Forte - 60 tabl. Advanced product support regeneration of joints and ligaments now available! The form of tablets further facilitates its use. Only effective active ingredients!